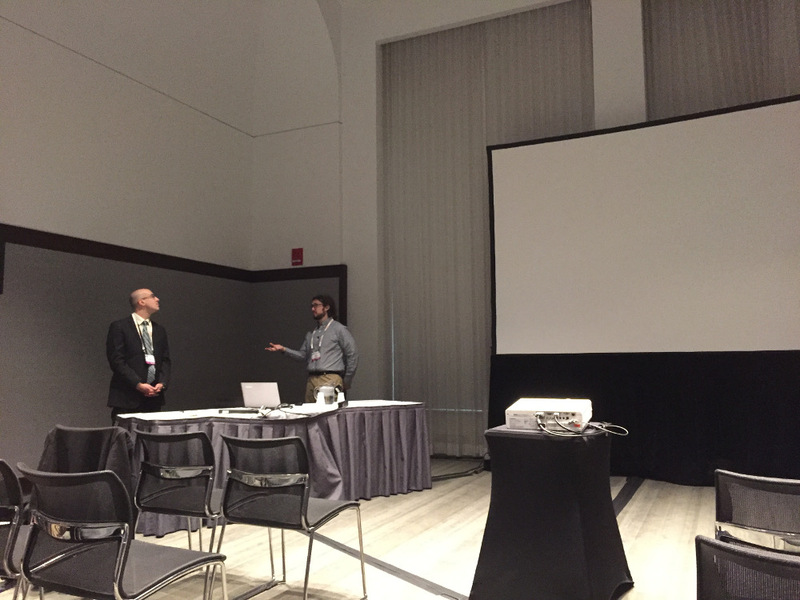 Prof. Hannes Schniepp and two of his doctoral students, Will Dickinson and Qijue Wang, recently traveled to the 2016 Materials Research Society Fall Meeting in Boston, MA. Will gave a talk and a poster presentation. Will's talk was on Using Atomic Force Spectroscopy to Investigate the Effects of Reservoir Pressure and Temperatures on Crude Oil/Rock Interactions. This presentation focused on recent experiments using a specialized atomic force microscope (AFM) capable of operating at elevated temperatures (100 °C) and pressures (100 bar) to measure adhesion between oil and a mineral surface in a brine. This work showcases the first force spectroscopy measurements taken at these elevated temperatures and pressures. Will's poster presentation was titled Rapid Optical Method for Morphological Characterization of 2D Materials. This new method provides for full lateral size and layer number characterization for 2D materials such as graphene, graphene oxide, or transition metal dichalcogendides. However, it does so using only standard optical microscopy and open source software, making it rapid and cost-effective.